First numbers: How successful are Spotify’s apps? Are Spotify’s new apps the missing piece to the social music puzzle or merely gimmicks that are ignored by the majority of the company’s users? It has been a month this week since Spotify rolled out its app platform to all of its users, and we thought it might be worth taking a look at how successful the apps currently available through Spotify’s client actually are. 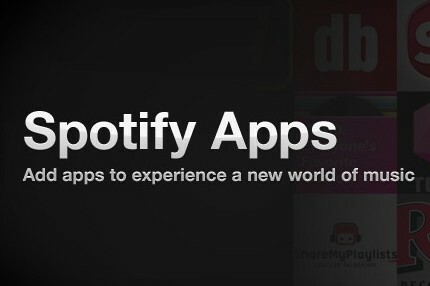 To recap, Spotify officially announced its app platform at a worldwide event in late November, and the company’s CEO, Daniel Ek, said at the time that the platform was “bringing music to where it should have been.” The apps themselves are essentially web applications that live within the Spotify client and offer functionalities such as playlist sharing, curated listening and data around music. I was initially pretty disappointed by the platform, but I would be more than happy if the data proved me wrong. Soundrop’s genre-based chat room app has seen a total of 265,590 unique visitors since Dec. 20. “We’ve had almost 32700 tracks added, 2.4 million tracks played,” Soundrop representative Thomas Ford told me via email, adding, “Soundrop users have played music for a total of 7453 days, 5 hours, 47 minutes and 20 seconds.” He also said that retention has been very good, with 30 percent of all users coming back within one day and 50 percent coming back within two days. ShareMyPlaylists.com has seen between 6,000 and 10,000 unique visitors per day for its Spotify app. “This has resulted in a 200% increase in new members to our site and a huge 400% increase in playlists uploaded to ShareMyPlaylists.com,” according to the company’s CEO, Kieron Donoghue, who also credits Spotify as being a big contributor to a major milestone. “This week we’ve hit 1 million playlist generated by our Playlist Generator,” Donoghue told me. This data obviously just offers a glimpse at the initial performance of the Spotify app platform, but it is definitely encouraging, as it seems to suggest that users who try out apps keep coming back to them. It remains to be seen how these numbers will develop once the platform sees a lot more apps than the dozen currently available, and it is still unclear how third-party developers will be able to eventually monetize the traffic within Spotify’s client. But one thing seems to be certain: Spotify users like the functionality provided by apps, and they are eager to find new ways to explore Spotify’s catalog. Agree also. Startups which rely entirely on Spotify make shaky investments. Secondly, the above figures show visitors. How about revenue? Spotify is headed for a huge decline. #deadpool within 2 years. Mark my words.